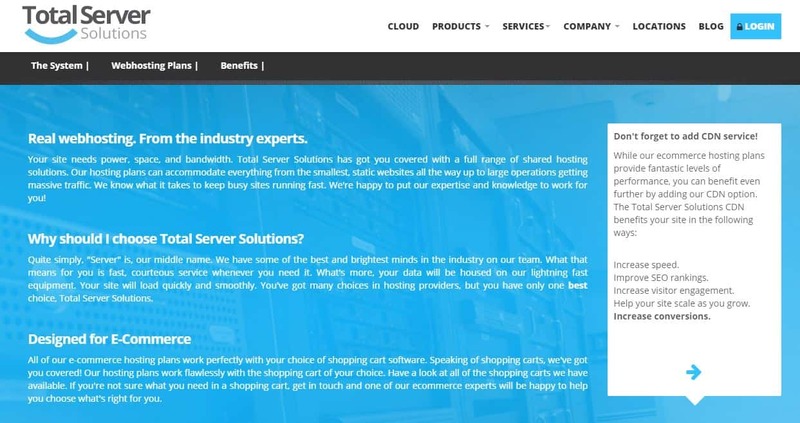 Total Server Solutions Review 2019: Is Total Server Solutions a Good Hosting? Total Server Solutions provides fully managed servers, server management, restoration, and maintenance. They have data centers located worldwide, including the United States, Canada, Amsterdam, London, Tokyo, and Sydney. As the name implies, Total Server Solutions provides fully managed servers as well as server management, restoration, and maintenance services to both individuals and businesses of all sizes. They have data centers located worldwide, including the United States, Canada, Amsterdam, London, Tokyo, and Sydney. Founded in 2005, they’re currently based in Atlanta, Georgia. Total Server Solutions also offers individual services such as server optimization, restoration, and migration. On the other end of the spectrum, the Enterprise e-commerce hosting plan provides 10x the amount of storage as well as a dedicated IP address. There is no free plan available, but that’s understandable given their product offerings. Their plans begin from their affordable e-commerce hosting solutions, go all the way up to high-performance cloud hosting packages. Their premium package also offers dedicated server management. Their e-commerce hosting packages include a 60-day money back guarantee. Given the level of service they’re offering, it’s no surprise that moving between plans is a little more involved than just clicking a button in your account management portal. To get more details on upgrading or downgrading your plan, you’ll have to speak with their customer service representatives. Total Server Solutions prides themselves on first-rate customer support, with most tickets responded to within 10 minutes no matter the time of day. Support is available around the clock. Each and every agent is a highly-qualified system administrator able to expertly field any technical questions. When I contacted them via live chat, I was connected to an agent in under a minute. Total Server Solutions also has an email and toll-free number listed on their website. onClick="trackClickout('event', 'clickout', 'Vendor Page - Visit User Reviews', 'Total Server Solutions', this, true);"
Director of IT - Very dissapointed with my experience. Total Server Solution purchased my hosting provider Zerolag. The transition from Zerolag to Total Server Solution (TSS) has been painful. I feel like I get no personal support no visibility into my environment and I have to make a support ticket to communicate with Billing, sales, support, or anyone. No phone number or email addresses. Three months ago we had an urgent need to double our server environment. It took them three weeks of back and forth through a support ticket and I finally received a phone call and they delivered a quote. In that same time, we had another company (Nexcess) stand up a completely new environment (7 servers) and we completely migrated off TSS. We are still locked into a contract so my suggestion is if you want to try TSS out don't be like me and get locked into a long contract. In our time of need, they were not available. Total Server offer premium services, and they do it well. If you’re in the market for a reliable, extremely well-supported e-commerce hosting plan or perhaps a dedicated server management specialist, you can’t go wrong with Total Server Solutions. Wondering how Total Server Solutions stacks up against other Web Hosting companies? Enter any other Web Hosting company and we will give you a side-by-side comparison.